The Goblin Market has always been the centre of Sin’s world. She’s a dancer and a performer, secure in her place. But now the Market is at war with the magicians, and Sin’s place is in danger. Keeping secrets from the market she loves, struggling with a friend who has become a rival, Sin is thrown together with the Ryves brothers, Nick and Alan – whom she’s always despised. But Alan has been marked by a magician, to be tortured as the magician pleases, and as Sin watches Alan struggle to protect the brother he loves, she begins to see both brothers in a new light. But how far will brother go to save brother – and what will it cost them all? A full on rollercoaster of emotions. I was left in tears as I turned the final page. This is definitely a five star read. If you haven’t read The Demon’s Lexicon yet, where have you been? Get on to that now, as these books are so laden with twists that my review may spoil the start of the series for you. We’re introduced to Sin, who hasn’t appeared often in the previous two books. Her perspective adds a new layer to the dynamic. Raised in the Goblin Market, she’s grown up knowing demons are bad, but magicians are worse. Demons possess and kill people, but the magicians are the ones who feed the people to them. Sin had always thought the Market was her home, a place she would eventually lead one day; that was until her home kicked her out. Taken in by the Ryves brothers, Sin gets to see a new side to the boy she’s always despised. Alan however, has a magician’s mark on him, one in which he took to save Sin’s baby brother. One that allows the magicians control over him. He can be tortured at any moment. It’s a debt Sin can’t possibly repay. The Alan she thought she knew isn’t exactly as bad as he seemed. This Alan, is an Alan she could possibly like… except for the fact that he has no interest in her. Alan’s always worrying about his demonic brother, Nick, above all else. And Nick’s too busy worrying about Alan. It’s a brotherly-love fest. I won’t go into any more of the plot, but there is plenty of it. It’s something you need to experience for yourself. 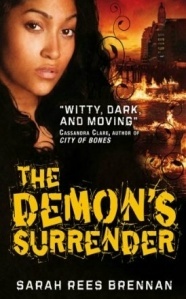 The Demon’s Surrender is fast paced, with so many twists and turns, that thankfully I didn’t predict. What really makes the book however, are the characters. I can’t help but love them all. If the book had taken place solely in a hut while Nick and co. did a barn dance, I still would have loved it. No matter whose perspective Sarah writes from, she manages to draw out their individual traits and emotions, making them distinctly real in a way few books ever do. Seeing Mae, who I loved in the last book, through Sin’s eyes was a completely different experience. I actually found myself loving Sin more than Mae. The romance didn’t feel rushed. 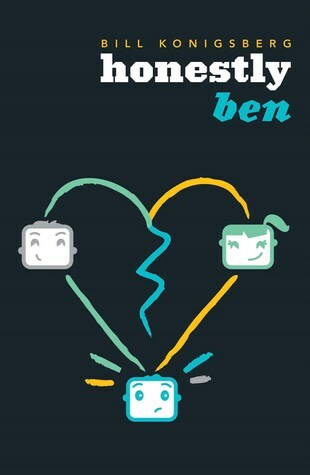 It played out gradually, allowing the relationships to build in a believable way. Which made it that much more enjoyable when it finally culminated. The couplings were perfect, all of them. These characters have so much spirit, the depths that they would go to for each other, you can’t help but feel warm inside. I know I’m gushing, but I really do love this book. It really shows how much the characters have grown since the first time Jamie and Mae stumbled into Nick and Alan’s lives. Nick will always be my favourite character. His lines are just perfect. I don’t know Sarah’s brain comes up with it all, but I love it. I laughed so much throughout this book, he’s the perfect blend of snarkiness and stoicism. But that’s not to say it’s all sunshines and roses. Probably the darkest of the three books, Sarah treats her characters gut-wrenchingly horrible, in the most amazing kind of way. I had to wipe my eyes so many times, just so I could keep reading. I knew as soon as I put this book down, that I had to give it five stars. If I danced up a demon and it asked me what book I’d take to a deserted island, I’d tell it this one (but of course, I’d sneak Lexicon and Covenant along too). Everyone. Okay, I’ll give you a bit more to go on. If you like Cassandra Clare’s books, you’ll love this. But if you’re reading this review, you’ve probably already gotten yourself hooked on this series like me, in which case, you’re awesome.